We have had a busy morning with 3 visitors before break! 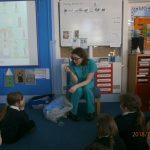 Mrs Drysdale came in to tell us about her work as an anaesthetist, and shared with us why she chose to be this special type of doctor and what sorts of things she does. 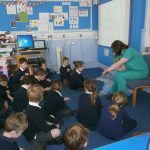 She explained that it takes lots of hard work to become a doctor but that it is worth it as it is a very rewarding job when you feel you have helped people. 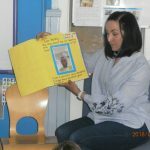 Thank you Arlene for coming in to talk to us. 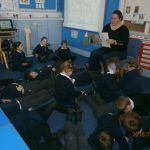 Louise Potter came in to tell us about her job as a Psychologist, helping people who find it difficult to sort their thoughts out and who may be very sad or angry. 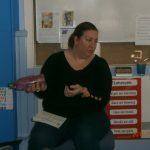 Louise brought in a snow globe that Lewis made that shows just what happens in our heads when we’re feeling muddled or angry – we sometimes feel very jumbled up. 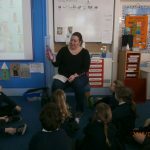 Louise told us that it takes a very long time to become a Psychologist, but it is a wonderful job that she loves. Thank you Louise. 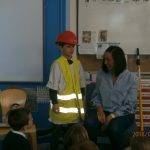 Finally Mrs Dalrymple came in to tell us about her husband’s work being a Painter and Decorator. 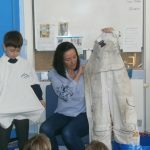 She showed us some of the equipment he uses and the clothes he needs to wear to stay clean! 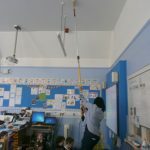 We learned that he needs lots of skills to do his job, from maths and numeracy to be able to measure accurately to a head for heights to climb his very long ladder! 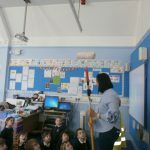 Thank you Mrs Dalrymple for telling us all about being a decorator.